This dynamic, energy-filled event was more than just a competition and included Project Exhibitions, Keynote Speakers, and Networking Opportunities. 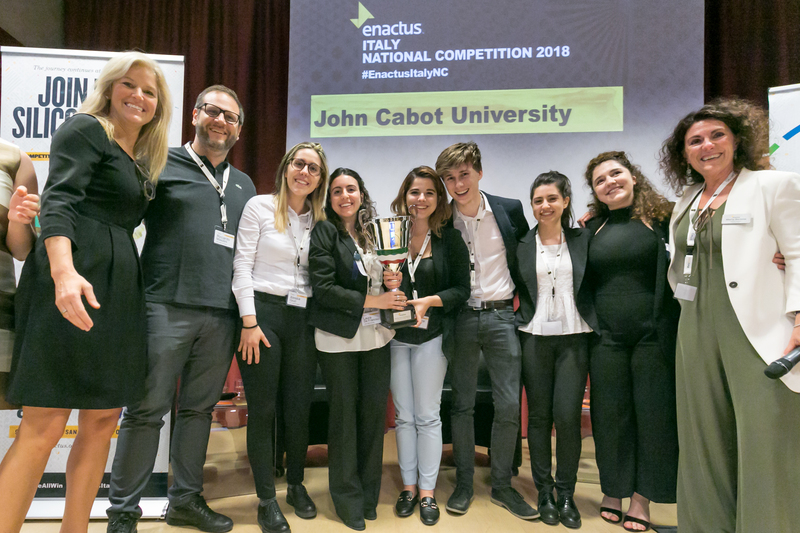 For this special occasion, we had the honor of having Rachael Jarosh, President & CEO of Enactus, to grace the second edition of Enactus Italy’s National Competition, a day of celebration, competition and collaboration. Throughout the day, Enactus students showed us how, by taking action for change, we can face a world where the pace of change cannot easily be stymied. Demonstrating to all of us how, together, we can transform problems into opportunities. This group of young, energetic, socially conscientious people with a head for business and a heart for the world showed us the face of a better Italy, where the next generation of business leaders is moving forward to work side-by-side with people in need, thus allowing them to live up to their fullest potential. But none of this would have been possible without the help and support of our donors from Fondazione Caritro, Fondazione Trentino Università, KPMG, CHEP, Randstad, Carlisle Brake & Friction, Clevertech, Microsoft, DANA who play an essential role in advancing our work to improve lives, strengthen communities and develop the socially responsible business leaders of tomorrow. Before the announcement of the winners, we joined the celebration of the festival of Economia, by hosting an inspiring conversation between business leaders and entrepreneurs on how to transform the entrepreneurial ideas of the next generations into job opportunities in line with the sustainable development global goals. The projects of the seven universities represented at the National Competition were judged by our donors and representatives from Altrove Reporter, Banca Euromobiliare, Bosch, Deutsche Bank, Fondazione Bolzano, Fondazione Cariparma, Fondazione Cariplo, Fondazione Cariverona, Fondazione Gorizia, Fondazione Venezia, Viaggi Giovani. After being inspired by each and every project presented, John Cabot University was announced National Champion and Università Cattolica del Sacro Cuore as Finalist. We welcome you all to join us for the Enactus World Cup in SILICON VALLEY, San Jose California from the 9th to 11th October 2018 to celebrate how when we advance the global goals #WeallWin.